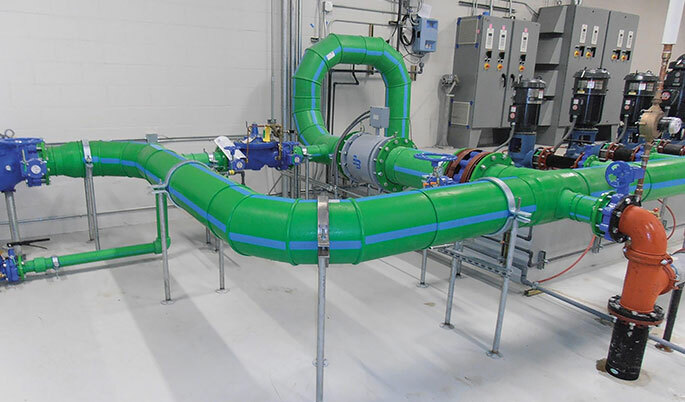 The Plastics Pipe Institute Inc. (PPI), the major North American trade association representing all segments of the plastic pipe industry, has created the Polypropylene Pressure Pipe Steering Committee within its Building and Construction Division (BCD). This new group focuses on two types of polypropylene pressure pipes: PP-R (polypropylene random copolymer), and PP-RCT (polypropylene random copolymer) with modified crystallinity and temperature resistance. Both types are approved for potable hot and cold water plumbing systems, hydronic heating and cooling systems, as well as other applications. PP-R and PP-RCT pipes are available in metric sizes ranging from 16 to 355 mm and IPS schedule 80 sizes ranging from 1/2 to 6 inches. The minimum hydrostatic pressure ratings are 160 psi at 73ºF and 100 psi at 180ºF for plumbing applications, but pipes with different dimension ratios (DRs) can have higher or lower pressure ratings as needed by the customer.